﻿ FEMTABS ® : Rx Vitamin Mineral Supplement by Mediniche, Inc.
New FEMTABS, developed in conjunction with ob/gyn’s, is the first supplement to supply essential vitamins and minerals to help support the nutritional needs of hormonal contraceptive users.† As reported in studies, hormonal contraceptives can affect the metabolism of several nutrients and result in deficiencies or increased dietary requirements. FEMTABS is designed to provide specific micronutrients that are tied to reported nutritional deficiencies and needs of women using hormonal contraceptives. FEMTABS capsules are formulated with a “Triple Complex” of nutrients that includes an essential B complex of vitamins B1, B2, B3, B5, B6, B12, biotin and folic acid, an important antioxidant complex including vitamin A as beta-Carotene, lutein, selenium and vitamin C and a mineral complex containing calcium, magnesium, manganese, zinc, cooper, chromium, molybdenum and a small amount of iron; all key nutrients known to be helpful for women taking hormonal contraceptives. is the New Distributor for MediNiche Products! Hormonal contraception, e.g., birth control pills, intrauterine devices and contraceptive implants, is the most popular method of reversible birth control in the U.S., with more than 14 million women current users. The birth control pill was first introduced in the United States in 1960. Eight of 10 women in the United States have used hormonal contraceptives at some point in their lives. 23% of American women between the ages of 15 to 44 currently use hormonal contraception. It has been the subject of more than 73,000 publications and scientific reviews during its 55-year history. Among women currently using contraception, the most commonly used hormonal methods are the pill (9.7 million women) and long-acting reversible contraception (4.4 million women). Hormonal contraceptives are both the most effective and the most hazardous form of contraception. Many women have difficulty with hormonal contraceptives, while others seem to tolerate them well. They have been shown to affect a number of metabolic and nutritional processes. Over the years, studies have reported drug-nutrient interactions between hormonal contraceptives and certain vitamins and minerals. Oral contraceptives have been shown to decrease the levels of key vitamins and minerals and potentially increase the demands of other important nutrients. Adequate intakes of vitamins, antioxidants and key nutrients have been shown to help reduce the potential toxicity of oral contraceptives. Most of the B vitamins, particularly pyridoxine (B6) and folate, are needed in higher amounts when hormonal contraceptives are taken. Zinc, calcium and magnesium levels in the body often fall and an increased need for vitamins C and E may also result from the use of oral contraceptives. The use of hormonal contraceptives is more common in young women and teenagers, which adds another dimension of uncertainty regarding the nutritional effects of these drugs. A healthy diet, high in nutrients, is the best protection against any potential nutrition related problems from hormonal contraceptive use. Unfortunately, many women, and especially adolescents and younger women, are at high risk for improper diet. Fad diets, fast food, reduced dairy product use combined with increased carbonated soda intake is common with these groups. Many nutritional experts recommend that women on hormonal contraceptives, especially young women, take supportive nutritional supplements. Given that one quarter of all women who smoke cigarettes also take birth control pills, and over half of those smoke heavily, hormonal contraceptive users are at additional risk of deficiencies due to reduced nutrient serum levels from oxidative stress and free radical formation associated with smoking. A major exogenous source of free radicals is cigarette smoke. Cigarette smoke is a complex mixture of approximately 5,000 chemical compounds, including high concentrations of free radicals and other reactive oxygen species. To compound the problem, antioxidant deficiency in smokers may be enhanced by their generally lower intake of either dietary or supplemental antioxidants. Several reports provide compelling evidence for a beneficial role of specific antioxidants in the prevention of smoking-related oxidative damage. FEMTABS is designed to provide specific micronutrients that are tied to reported nutritional deficiencies and increased nutrient requirements of hormonal contraceptive users. FEMTABS is formulated with selective nutrients that address known hormonal contraceptive user concerns. Vitamin B6 is provided to help prevent deficiencies associated with mood changes/depression that can emerge during early and sustained use of hormonal contraceptives. Vitamin B6 can also help minimize amplified premenstrual syndrome (PMS) that can accompany hormonal contraceptive use. Folate is included to help prevent documented deficiencies noted in hormonal contraceptive prescribing information (package inserts) that can result in cervical abnormalities and anemias. FEMTABS contains Metafolin®, a patented, natural form of (6S) 5-methyltetrahydrofolate (5-MTHF). L-¬methylfolate is the naturally occurring, predominant form of folate commonly found in cells and participates as a cofactor in a reaction that involves the re-methylation of homocysteine to methionine. Unlike synthetic folic acid, L-methylfolate can be used directly by the body, without the need for an additional conversion via the enzyme 5,10 methylenetetrahydrofolate reductase (MTHFR). In certain populations, the body’s ability to convert folic acid to 5-MTHF by use of this enzyme may be compromised due to genetic differences. Metafolin® contains only the S isomer of 5-MTHF and has been shown to be the only form of folate to be able to cross the blood-brain barrier. Moreover, a major B complex component consisting of vitamins B1, B2, B3, B5, B6, B12, biotin and folate combined with vitamins C and E and magnesium help support heart and vascular health. Are you currently using hormonal birth control? If so, consider using FEMTABS. 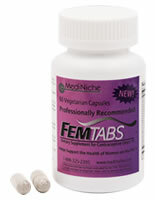 FEMTABS® may be a useful dietary adjunct for women taking hormonal contraceptives. Lutein (from marigold flower) 5000 I.U. Suggested use - Adults take 2 capsules daily with meals or as directed by your healthcare professional. Side Effects - No adverse effects have been reported. Storage - Store in a cool, dry place, away from direct light. Keep out of reach of children. Note: All information on this website is intended for your general knowledge only and is not a substitute for medical advice or treatment for a specific medical condition. Please consult your physician if you have questions or concerns regarding your health. Copyright © 2003-2016 Mediniche, Inc. All rights reserved.